I finally picked this up from the library this past weekend and started it immediately. 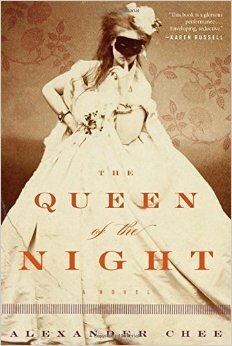 The Queen of the Night has been absolutely enchanting and I can hardly put it down. "WHEN IT BEGAN, it began as an opera would begin, in a palace, at a ball, in an encounter with a stranger who, you discover, has your fate in his hands. He is perhaps a demon or a god in disguise, offering you a chance at either the fulfillment of a dream or a trap for the soul. A comic element—the soprano arrives in the wrong dress—and it decides her fate. The year was 1882. The palace was the Luxembourg Palace; the ball, the Sénat Bal, held at the beginning of autumn. It was still warm, and so the garden was used as well. I was the soprano. I like your description of the book as "enchanting." That makes me want to read it. I also like the way the author sets the stage in the opening paragraphs. Sounds like an entertaining story. I actually didn't like this one ... hope you love it, though. I like the opening, but am hesitating because I've seen such mixed reviews. Hope you enjoy it! I don't read much historical but, I hope u r enjoying this one. Not for me, but I'm glad your enjoying it! I SO WOULD. Sounds amazing and I need it now!